INDIANAPOLIS – With spring yard work now in full swing, it is important for everyone to remember the law requires you to place a phone call to 811 at least two full working days prior to engaging in any project that involves digging. 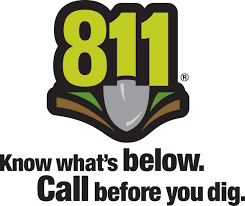 By placing this call, Indiana 811 will notify underground utility owners of your plans so they can dispatch personnel free of charge to mark the approximate locations of their facilities with paint or flags. Every digging project, no matter how large or small, warrants a call to 811. Installing a mailbox, building a deck and planting a tree are all examples of digging projects that should only begin after you have waited at least two full working days after calling 811 and confirmed that all facility owners in your area have either marked their lines or declared the area clear of any lines. Make a phone call, not a judgment call. Learn more about 811 at www.indiana811.org and keep your project safe for you and your neighbors.